During the Song Dynasty, a Mongolian raised Han Boy begins a path to becomes a legendary national hero in China. I'm not the type that always prefers the old to the new. I quite embrace new versions. However, this rendition of Condor Heroes was a waste of my life. No depth in conversations, very annoying acting. 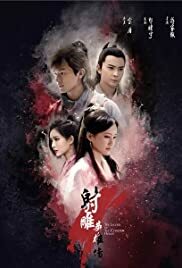 They cut out alot of lore and background, so I doubt this is a good watch for those new to the Condor Heroes franchise. The sad fact is that this drama focused completely on CGI and action scenes but skipped EVERYTHING else. There are however even faults with the action scenes! For a Martial Arts film, all it did for every episode was fist fights... All the types of martial arts, and focus on skills and training were thrown out of the window. Basically everyone more or less fought the same, taking away the fun of watching each style of martial art being represented. Nice sceneries and backgrounds were its only saving grace. If not this would have been 1/10.